A tantalizing new offering from Ford is currently on display at the Geneva Auto Show. 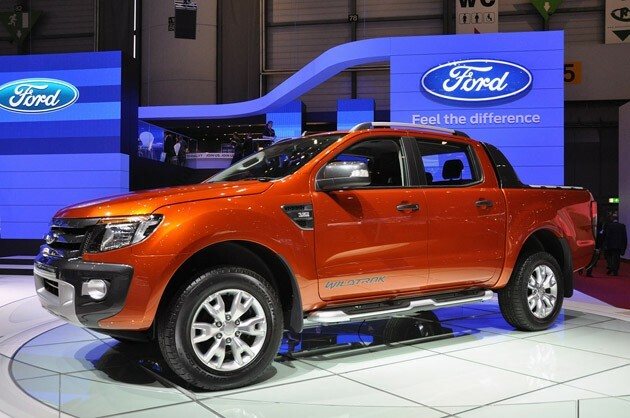 The 2012 Ford Ford Ranger Wildtrak will be released seemingly everywhere but North America. For now, North America Ranger fans will have to make do with an antiquated unit that looks more at home in 1995 than 2011. The most enticing feature of the Ranger Wildtrak are engine choices being two common-rail Ford Duratorq TDCi diesel engines. The standard engine will be a 2.2L diesel which produces 277 lb/ft of torque. An optional 3.2L diesel the puts out 197 horsepower and stump-pulling 347 lb/ft of torque. Either choice will be mated to a 6-speed transmission. With the current trend in fuel prices, would these units not cause a huge stir over here? Other features include an electronic stability system, satellite navigation, Bluetooth, iPod integration and voice recognition. The units are apparently off-road ready and can tow up to 7,385 pounds (3,350 kilograms). Check out the photo gallery at Autoblog.